Quite Possibly The Biggest Blog Sale You've Ever Seen!!!! This is Out of My Comfort Zone! 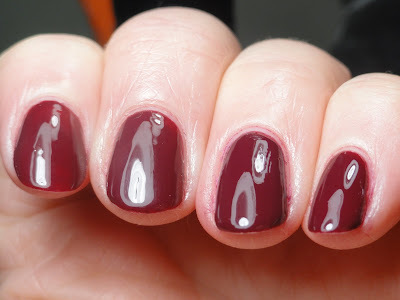 Borghese was on sale at Shoppers Drug Mart (well, a sale is $9.99 versus $13.99 regular price; even the sale price is still on the expensive side)...this is Palermo Plum C.
A little dark/vampy for me...at least my interpretation of dark/vampy..lol! And of course had to stamp it! Used IP XL B, with China Glaze Emotion. I've decided to do some experiementing with different topcoats/variations of how to use SV in my efforts to find something that will stop the dreaded SV shrinkage so I tried a non QD topcoat on top of my stamped image on my thumb before SV but it streaked the stamp as you may be able to see above. I'd rather have a little shrinkage than a streaky stamped image...so I'm going to start experimenting until I find something that works for stamping and doesn't shrink...and provide the great shine and quick dry of SV!!! I really like the iridescence in this polish; its the same as Nina Ultra Pro Royal Purple that I posted here....I wish I could find this finish in every colour.....Here's two coats of Romp by itself....I have quite a few Cheeky Monkey polishes but haven't used them yet...I think that will change soon....so much polish; so little time! Do you swap? I have to thank everyone who does as it is a great way to obtain polish/plates etc that you otherwise would never have as well as help someone else out in obtaining their lemmings...I've even swapped with some of you!...so thank you! The nail blogesphere has some awesome, amazing ladies out there and it is an amazing concept so kudos to whoever thought of it!! Used five Essie's for my last mani and when it came time to pick out a polish for my last mani, another Essie was calling my name! The sun was bright even on this cold day so I was able to take a pix while sitting in my car waiting for my morning coffee! These pix were taken in the wee hours in the morning under artificial light but the holo was still visible...but much more in the sun!! It was fantastic to see the sun the last two days...I sure hope spring is right around the corner. My oldest son is 15, heavily into sports; my daughter is 13 and does dance, her nails and likes to hang around with her BFF's, my youngest son will be 11 in less than a month; he loves video games and swimming; then there's Mr. Rexy and I! Mr. Rexy loves the Leafs and beer and I love to do my nails! Polishes are all Essie, from ring finger-Lapis of Luxury, Lily Pond, Turquoise and Caicos, Barbuda Banana and Splash of Grenadine. Images Plates were fauxnad D, HB48, HB14, t28, T22 and T46, using Koand black special polish. I hope you had a fantastic Monday...whether it was President's Day in US, Family Day in some provinces in Canada or just another Monday! ...every Saturday night at my house...and here's one for the home team! My hubby is a huge Toronto Maple Leaf fan and our tv is turned onto the Leafs game every Saturday night...and any other night they happen to be playing! 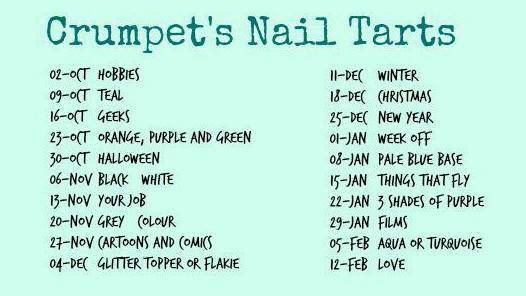 Base colours are Misa It's Electric and OPI Bride's Bouquet. Stamped using Beautiful Scratchers white polish and Konad blue special polish using IP fauxnad m56. (This is the same plate that has the Canada flag image on it; I just tried to be specially careful and only stamped the leaf.) I also think a similar image is on fauxnad IPH21. And then I decided to make it girly! On the blue, added a light coat of Savvy Touch of Glimmer and over the white, added too many coats to mention of OPI Absolutely Alice and Finger Paints Sapphire Shimmer. GO LEAFS GO!!!! I remember as a kid my grandpa watching the game every Saturday night, even if it was on the French channel and he couldn't understand a word-he'd also tune into the radio if it wasn't televised-he was a huge fan too! This post is dedicated to my husband who is holding out on hopes that Toronto makes it to the playoffs this year!! GO LEAFS GO!! As soon as I picked up the bottle of China Glaze Crackle in Fault Line, I was planning my mani in my head.. 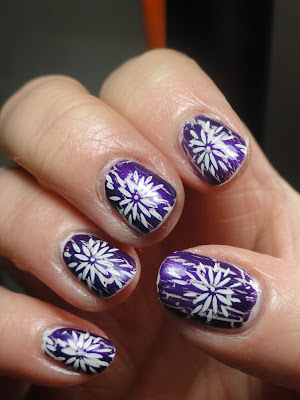 I wanted white underneath topped with CND Amethyst Sparkle so that the purple shimmer could show thru. Below is two coats of Amethyst Sparkle over top of CND Brilliant White. Big hopes....Or so I thought. Unfortunately, Fault Line cracks in big chunky pieces so you don't see much of the base colour. Total waste of the expensive CND sparkle effect. 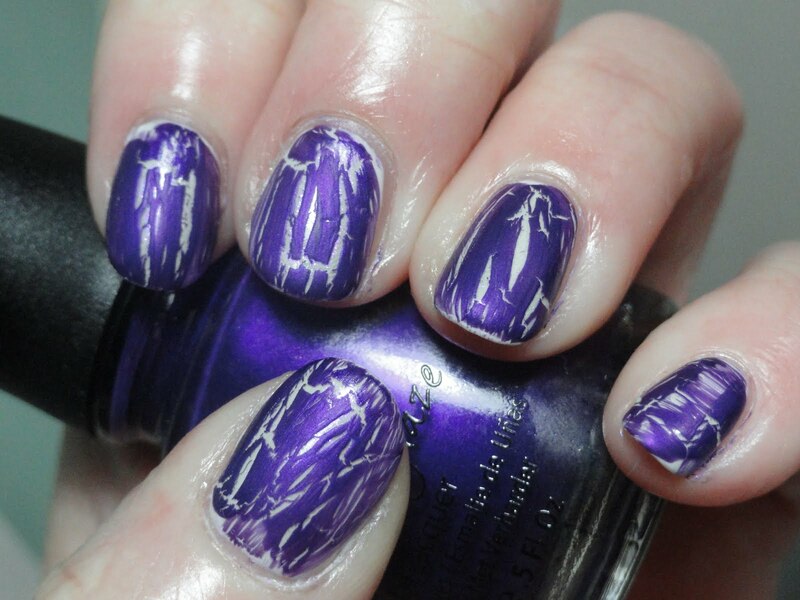 Here's my right hand stamped...there haven't been too many images out in the blogesphere with shatter/crackle stamped (at least not that I've come across) plus I wanted to try it for myself. The good thing is that crackle with a topcoat of SV is smooth enough to stamp over. This is stamped using Beautiful Scratchers white polish, fauxnad IP XL E.
And on my left hand, I added a coat of OPI Black Shatter. I was just fooling around ....but in some ways, I like it even better! I think the layering of crackles/shatters could have lots of possibility if the colours underneath are visible if the polishe crackles enough. 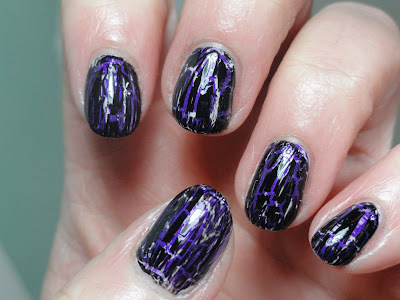 I may try this again when OPI releases their new crackle shades as their polishes seem to shatter more! I guess they all can't be successful...but none the less, a great opportunity to experiment so not all of a fail! Last night, I was trying to pick a colour and for some odd reason, my eye kept on gravitating towards pinks, purples and reds...all of which I've worn plenty over the past two weeks so really didn't want to do another. So when Icing Roger That caught my eye, I knew it was going to be today's mani. This is more green then blue, but unfortunately, the colour wasn't captured accurately with my camera. I had bought this Icing polish after discovering that there are a couple of Icing by Claire's stores in my general area so went to the one closest to me over the summer. (I was really looking for Icing Black Out-I got it too, but its still untried). This polish was on sale for $2.87 when I picked it up. I don't have anything like it in my stash so was glad I did. 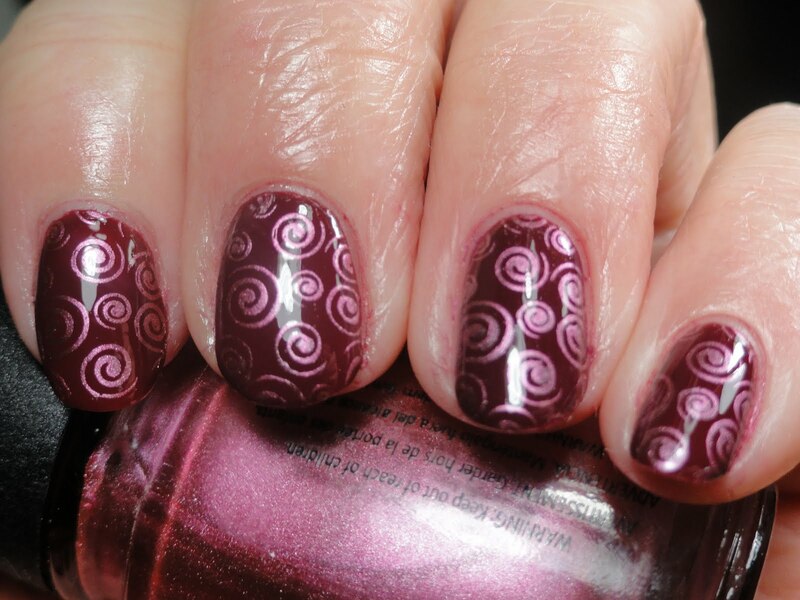 Stamped using Beautiful Scratchers special polish in white using IP XL E, then dotted with a yellow polish pen. 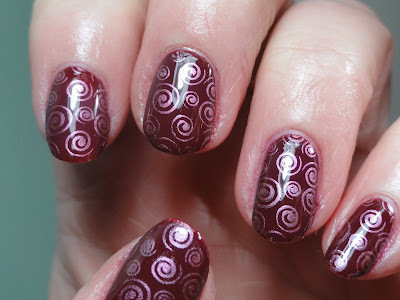 This is the Valentine's Day mani that I'm wearing today. OPI Bride's Bouquet topped with China Glaze White Cap; thumb is Wet n Wild Rockin in Rubies...it appears to have the same glass fleck like White Cap which is why I picked it! Stamped with Konad red special polish and Beautiful Scratchers white using IP's A24, HB03, fauxnad F and fauxnad m04. I intially had used Konad white special polish but it didn't pop bright enough and I remembered that I had Scratchers polish in white and got the results I was looking for. Here's polishes before stamping. White Cap is gorgeous for layering. I hope you have a wonderful Valentine's Day whether its with your significant other or just hanging out with friends! I thought I'd try my first gradient...when I swatched it on paper, it seems sheer enough to include some stamping nail art as the gradient was subtle enough let the stamp show thru. When I went to actually stamp it, the layers didn't want to allow the stamp to show so I had to improvise (unless I wanted to stamp with black and I didn't); here's what I came up with. While not what I had envisioned, not terribly bad. I got these Martha Stewart glitters last year for cheap cheap after Valentine's Day had passed-when Michaels puts all the stuff discounted to 80% off. I'll probably do another gradient sometime when my nails are a little longer so I can ensure I have enough room for stamping...lesson learned! I'm one of those super holiday freaks...my house is decorated for every holiday...I got the heart tablecloth on my dining room table, with hearts stones in the centrepiece that has floating heart candles, little hearts hanging from my lighted tree in the corner, Valentine's window decals on every window...I even send my kids sandwiches to school in those Valentine's sandwich bags from the dollar store (I'm sure my 15 year old DS just looooveees that, LOL)!! OPI's Texas Collection was just released in my area so I picked up three of them. They aren't super unique colours to me, but I don't have many jellies; decided to use OPI Too Hot Pink to Hold 'Em. I applied over a quick coat of Bride's Bouquet for two reasons-one, I don't like visible nail line and two, to brighten it up a bit. Unfortunately as I only did two coats, you can see a bit of the white on the tips. This was applied at around 1 am two nights ago. 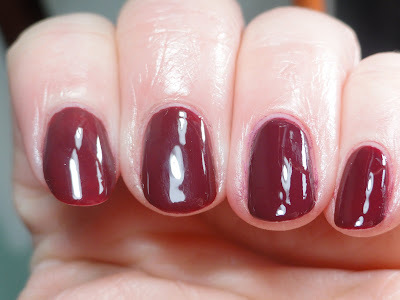 I had decided to try another quick dry topcoat as I was tired of the shrinkage from SV. I actually didn't have any shrinkage, but even though I went to bed an hour after I did my nails, I woke up with sheet marks on my mani...Urgggg. So I had to cover it somehow, so last night, topped it off with a coat of Nicole by OPI Spark My Mistletoe. Then added a black french tip, freehand with one of those pens you can pick up at Walmart (I've only did this once before, you can tell!) As uneven as this is, I know it would be wayyyy better than my french tip stamping! And lastly stamped with Konad black special polish using IP BM02. Here's mani after stamping without topcoat....which is why I like to topcoat it...see, the black stamp below doesn't 'pop' like the pix above! So another Valentine's Day Manicure...and red at that! Proud Member of the Digit-al Dozen! 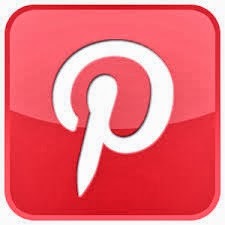 40 Great Nail Art Ideas! I discovered Konad a few years ago and it has captivated me ever since! I have a large polish and plate stash that keeps on growing! 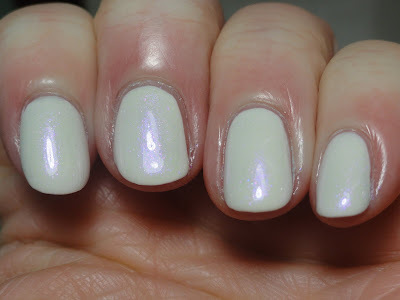 The biggest challenge I have lately is...what polish with what plate! If you're interested in a polish swap, or want to contact me, I can be reached at: mrsrexy at gmail dot com. 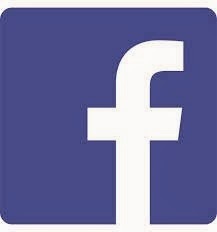 Canadian Nail Fanatic is (Finally) on Facebook!